Do you like to dress up your Springs luxury apartment home with current decorating trends? 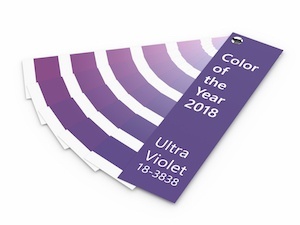 Color space giant Pantone has named Ultra Violet, a vivid shade of purple, as its Color of the Year for 2018. Ultra Violet may be too bold a hue for a total style commitment, but there are some clever ways you can use it to add pops of color for visual interest. Here are some of our favorite suggestions. Throw pillows are inexpensive and versatile, making them a perfect vehicle for incorporating any style trend. Throw blankets are practical and they also look great casually draped along the back of a chair or sofa. We love this gorgeous tabletop planter because it combines contemporary style with the natural appeal of greenery. As if that wasn't enough, air plants are low-maintenance and beneficial to your home as they remove carbon dioxide and filter pollutants. Add a subtle but effective touch of ultra violet as a highlight color in a poster or print. Ultra violet plays well with neutrals and looks dramatic when paired with complementary colors such as pink and blue. Changing lampshades is one of the easiest ways to freshen up home decor, but it's also one of the most overlooked. Choose one in a solid color or a pattern that again features pink and blue tones. Enjoy the luxurious look and feel of a soft rug underfoot in a rich jewel tone or a shimmering pastel shade. You might not think the kitchen offers many traditional decorating opportunities, but in fact there are several options, especially if you enjoy entertaining. Shades of ultra violet can be found in kitchenware from sets of drinking glasses to dinnerware and serving pieces. Is there such a thing as too many sheets or towels? Turn your bedroom into a royal chamber with purple sheets or a comforter, or step out of the shower and wrap yourself in a plush purple towel. Not interested in simply dipping your toes in the water? Make a statement with one of these striking furniture pieces. In the market for a new sofa? You can find some attractive and comfortable styles at some relatively inexpensive prices. Incorporate another popular trend with color-blocking. Whether your overall decor is traditional, retro or modern, there's a purple-hued chair to fit it. Want something a little whimsical? Try a pouf or ottoman. Have any suggestions to add to our list? Let us know in the comments!